* |cd,"not existing directory" fixed. * C_FSTAT command now uses current path (from |cd) when none given. For those of you waiting for the next batch of M4, a bit of bad news. I received the MCU chips I was waiting for friday (everything else is ready). Unfortunately the supplier (i****) send me a batch of STM8 chips instead of the STM32F407. I have another batch on its way, but may be 1-2 weeks before it's here, hopefully the right ones this time around. Sorry for the delay, it is out of my hands right now. No problem, thanks for letting us know. Trebmint fixed a network issue today which i had already for a long time! Because the CPC has this nice hardware now!!! I will make it better and hope to release it in the future so everyone can use it! At least i can share you the first real test! I'm looking really forward to IRC'ing from my CPC. That's gonna mark a huge milestone in CPC geekness. Also, hopefully it'll bring more CPC people together chatting. Is there any way of displaying the current directory? If I remember correctly, neither cat or IDIR commands show this information. I think an IPWD command would be really useful. Also, is it possible to copy a file (using ICOPYF command) from inside a .dsk file to the root directory of the SD? I did not have any luck with it, getting a "Not supported" message, so the workaround was to load the file (it was just basic), get to the root directory and save it. There is a command to get the current path (C_GETPATH) but there is no RSX using it, its a good idea to list the active path within the cat/|DIR (will add it next time around). And yes the |COPYF doesn't work within .DSK images. Tbh. there is so many features I could add, but at the end of the day how many will actually use them. Also the M4ROM source is available at github (M4Duke (Duke) · GitHub), so anyone could add custom commands, if they are good to the general users I can include them in the release build aswell. - Ie. @SOS just made a couple of functions, I'll likely add for next build, but otherwise you can put your own M4ROM.BIN file in root and it will be used instead of the built-in version. I did a few modifications at the M4Board network driver for the SymbOS Network Daemon, and now it seems to run much more stable. I was able to watch ASCII Star Wars with Telnet for a longer time until the first shooting scenes. Then the whole system did a reset, but that was already a great progress. At the same time EdoZ finished another alpha version of his IRC client SymIRC. I tried it with the new driver on the CPC and it was running stable for more than one hour. 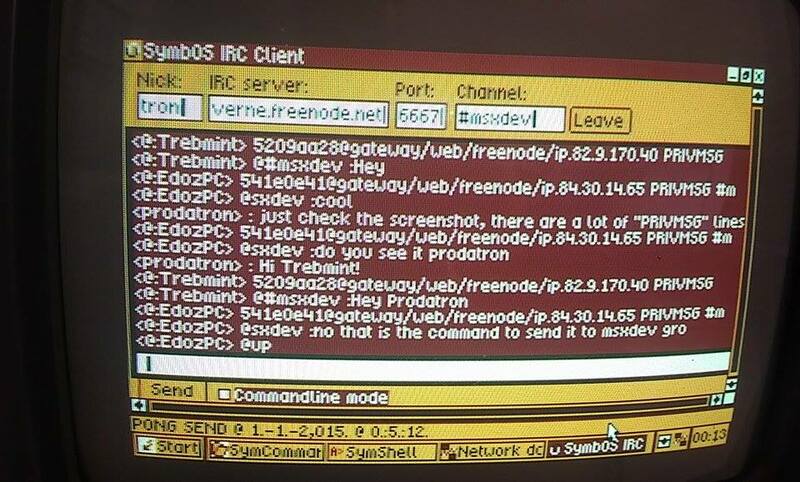 We had a nice chat with Trebmint and EdoZ, I wonder if it was the first time, when a CPC was connected to IRC with an own client? While having the IRC connection open I was able to download files with WGET simultaneously. That was my first real test with having multiple connection opened at the same time on the CPC! 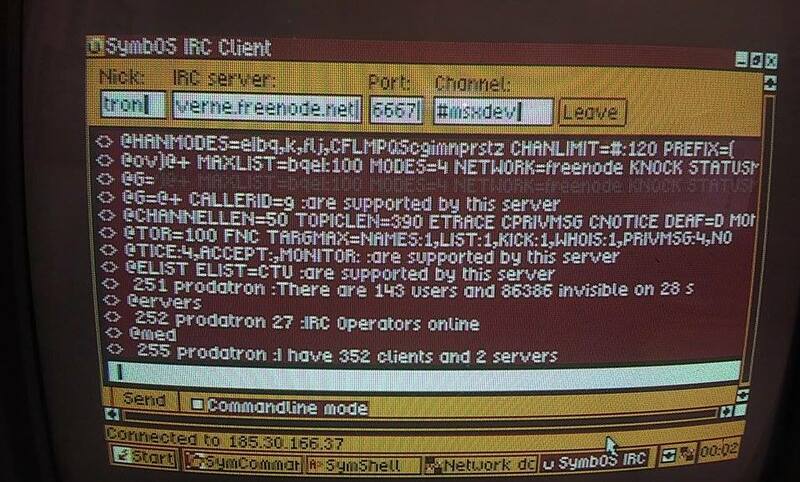 The SymIRC is currently not filtering all server messages, which shouldn't be displayed in the chat window. EdoZ is now working on removing all unnecessary stuff which is currently slowing down the output. I have to speak to Duke for some details again, but will do a preview release anyway as soon as possible. SymIRC is looking really promising!!! Awesometastic! Indeed great job done! And in a short amount of time! Keep the good work going. Great work ! 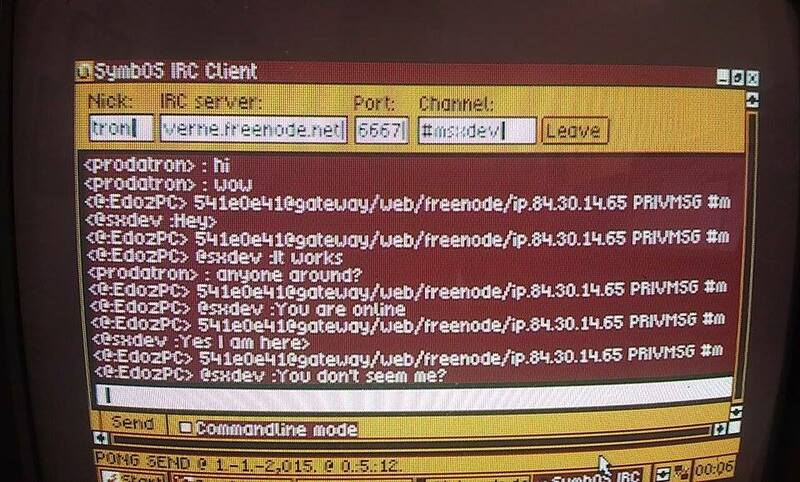 I'am looking forward to have a chat with irc! I'am a little bit confused with all the information in this thread how to use the M4 together with X-MEM. The simple method is to disable the romboard function of XMEM and use the 32 (33) romslots of M4 board. There is a jumper below the CPLD on the XMEM, which you can set to NO. If you wish to use 64 roms, you will need to go into the webinterface of M4 board and set romslot start position to 32, so that M4 roms will be mapped after XMEM roms. This will give some issues with the position of the M4 rom and replacing AMSDOS unless you got a CPC6128 which can replace rom 7. EDIT: I could make a lowerrom replacement for CPC6128 that will ie. use romslot 127 for M4 ROM, if there's interest. After the M4 introduction of directories and .dsk files, I decided I needed a disk navigation program to avoid all the typing for changing directories. I didn't want to start from scratch, so I modified a very nice little program (Disk menu by Joe Halstead) in order to support directory navigation. I am posting the .BAS code and the converted ASCII file (.TXT) in the hope that other members of the community will find it useful. - Since the original program used CAT command and this has not been modified, it probably will not work well with cards having hundreds of files. One ignorant question. Is posible acces to this?. Another ignorant cuestión, maybe is posible make the cpc can load the teletext Pages online?. I refer to teletext exclusively, not the entire web Page of course. Very good i use it renamed as autoexec.bas , so it is starting when i open my cpc! one only question how can i exit? The only trick i found is to load a .s file that gives me "line too long" to exit! Have you tried pressing ESC key twice? It is a general exiting mechanism from basic programs. Thanks @Takis Kalatzis, very useful. Page created in 0.252 seconds with 106 queries.